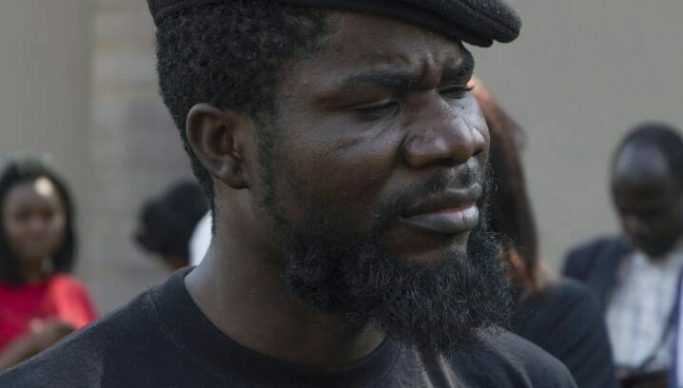 Civil rights activist Chama Fumba commonly known as Pilato was last week placed under house arrest by the ruling Patriotic Front leadership in Shang’ombo district, Western Province. And Pilato has apologised to the people of Shang’ombo district who travelled in numbers hoping to see him perform at the Tikanyo Festival. Pilato was in Shang’ombo at the invitation of Fight Inequality Alliance Zambia for the Tikanyo Festival meant to raise awareness on the development needs of the district. District Commissioner Lawrence Nyambe during a meeting with the organisers demanded that the festival be cancelled if Pilato was going to play any role during the event. The Shang’ombo joint operations committee raised concern with Nyambe when they realised Pilato who has been critical of PF government was part of the team of organisers that travelled from Lusaka for the three-day event. Following the demand from the local administration, Pilato was placed under house arrest for the festival period at Liwilu Apartments where he was booked for the period. Commenting on his humiliation in Shang’ombo, Pilato described the episode as unfortunate as there was nothing strange about him being in Shang’ombo. He said the confusion was engineered by the PF youth wing which is controlling the District Commissioner, a situation he described as unwarranted. ‘’It was just a team of little scared young people who don’t know what they are looking for in life,’’ Pilato said. “It was unfortunate that I was not given an opportunity to interact with the people of Shangombo but I’m glad that the festival was a success”. He appealed for tolerance of divergent views especially among all actors of development. Among the theme areas targeted for awareness were education, health, socio-economics, water and sanitation. Speaking in an interview with newsdayzambia.com, Pilato said the people of Shangombo deserved better than the current situation where they had limited access to basic human requirements. “The people of Shangombo are also tax payers like those in Lusaka therefore, by comparison Shangombo needs more attention than Lusaka,” Pilato said. “I travelled with a clear mind to meet and perform for you and to experience the festival together. Unfortunately, the District Commissioner Captain Lawrence Nyambe with some PF youth leadership were threatened by my presence in Shang’ombo,” he said. Pilato regretted that apart from cancelling his performance, he was not even allowed to accompany other team members to meet the people. “They insisted that I remain parked at the lodge the whole time or the DC would cancel the event. According to them, they feared that I could incite the young people of Shang’ombo to demand for better service delivery from him and his government,” he explained. “The District Commissioner of Shang’ombo wanted us to think that Shang’ombo was doing well and did not need any immediate attention from the government. This is the lie that he has kept telling the President and the entire cabinet”. Pilato said after visiting Shang’ombo, he strongly felt that the district needed urgent government attention in the provision of social services such as health care, water and accessible schools to young people who walk long distances. “Young girls have ended up in marriages as a way to survive the economic hardships in the district. The water situation is terrible. People get water from shallow wells which are infested with frogs and other things,” he said. “The good people of Shang’ombo who engage in agricultural activities are practically denied access to the market outside of Shang’ombo due to the terrible state of the roads”. He accused Nyambe of trying to hide the truth because he was enjoying himself with the family at the expense of majority residents who were enduring hardships. Pilato appealed to President Edgar Lungu to visit Shang’ombo and meet the people there instead of relying on Nyambe who was only there for nothing else but a salary. “The District Commissioner is nothing but a liability only there as a cost. The people and the dreams of young people in Shang’ombo district cannot be left in the hands of a retired captain,” he said. “If meaningful development is to be taken to Shang’ombo, a relevant leader should be taken there. Shang’ombo deserves better”. Pilato also expressed shock how Nyambe trembled in the presence of the PF youth leadership whom he could not look into their faces as they ordered him to ban him from participating in the festival activities. “To the PF cadres and youth leadership, I would like to remind you that you are Shang’ombo and Shang’ombo is you. Desire better for your district not for selfish agendas,” he said. Pilato advised the PF youths not to sacrifice the dreams and the future of the fellow young people of Shang’ombo. Pilato singled out Siloka, saying his ignorance and fear was understandable but urged him to realise how much development he could influence to Shang’ombo using his position in the youth leadership. “Thank you great people of Shang’ombo. One day I will come and we will dance together,” he stated.